Workshop Comparative Approaches to Ritual in Mainland SE Asia: Emergence or Resurgence? Research on rituals and practices on the margins of official or orthodox Buddhism in Southeast Asia has expanded considerably in recent years. The growing prominence and rising visibility of spirit mediumship, divination and other forms of ritual in all of the predominantly Buddhist societies of mainland Southeast Asia raise many analytical and theoretical issues that we believe require a comparative, regional perspective. In the past, inquiry on these topics has at times also been limited by a focus on institutional Buddhist practice and doctrine and a tendency to overlook the invocation of spirits and other ostensibly “unorthodox” forms of ritual. 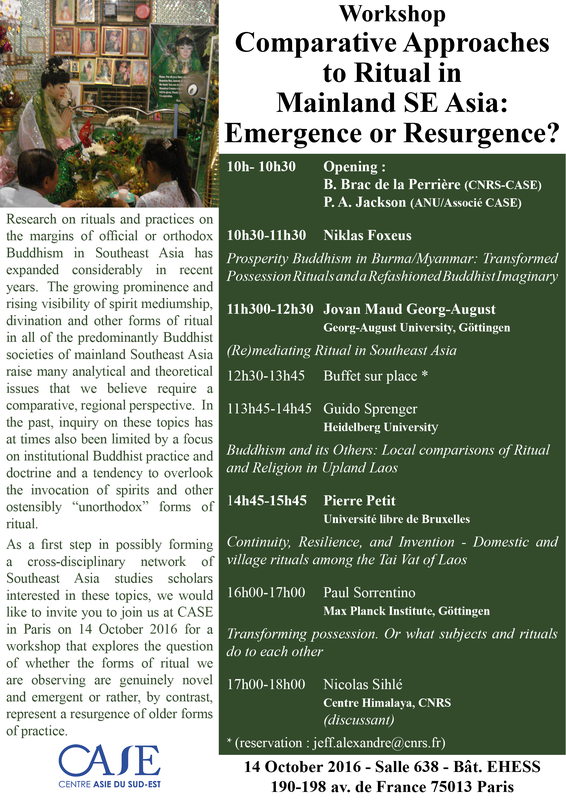 As a first step in possibly forming a cross-disciplinary network of Southeast Asia studies scholars interested in these topics, we would like to invite you to join us at CASE in Paris on 14 October 2016 for a workshop that explores the question of whether the forms of ritual we are observing are genuinely novel and emergent or rather, by contrast, represent a resurgence of older forms of practice.